IntelliScore Ensemble MP3 to MIDI Converter helps you figure out the notes, chord names and key present in multiple-instrument MP3, WAV, and WMA files and CDs. 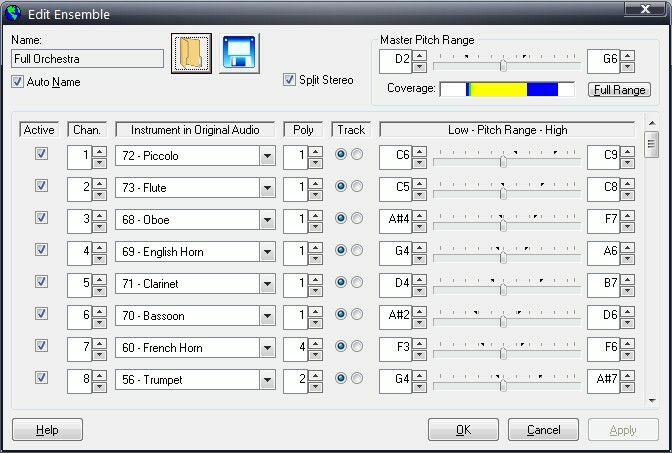 View and edit scores and individual tracks once your WAV, MP3, WMA, or CD files are converted into MIDI. Unlike "pitch detectors", intelliScore Ensemble can convert music that contains more than one note at a time (such as chords) and more than one instrument at a time. Are you looking for an easier way to get musical notation from recorded music? Want to play along to a favorite song but just can't quite differentiate between the guitar and bass parts. Let intelliScore do the difficult work for you. Spend more time making music and less time figuring out the notes. MIDI to MP3 Maker is an easy-to-use tool for converting MIDI file to MP3 format. Qweas is providing links to Intelliscore Ensemble MP3 to MIDI Converter 8.1 as a courtesy, and makes no representations regarding Intelliscore Ensemble MP3 to MIDI Converter or any other applications or any information related thereto. Any questions, complaints or claims regarding this application Intelliscore Ensemble MP3 to MIDI Converter 8.1 must be directed to the appropriate software vendor. You may click the publisher link of Intelliscore Ensemble MP3 to MIDI Converter on the top of this page to get more details about the vendor.